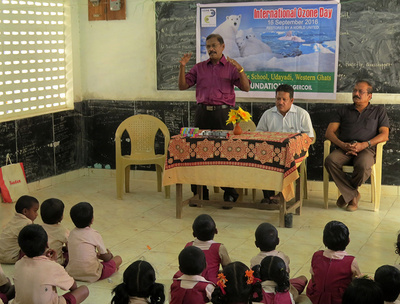 Nagercoil, International Day for the Preservation of the Ozone Layer was observed at the Adi Dravida Welfare Middle School, Udayadi on Friday by Tribal Foundationon on Friday, September 16. Delivering the key note address, S S Davidson, Managing Trustee of the Foundation said that the theme for the Day was Ozone and Climate: Restored by a world united. The theme was complemented by the tagline: Working towards reducing global-warming HFCs under the Montreal Protocol. He said that the ozone layer was like an umbrella that protected the earth for the ultra violet rays and infra red rays of the sun. Presently, the ozone layer was punctured by the green house gases and the rays of the sun passed directly to the earth without filtration causing more heat called global warming and its attendant climate change. He said that the theme recognized the collective and the global level efforts towards the restoration of the ozone layer over the past three decades and the global commitment to combat climate change. He quoted the UNEP statement that as a result of concerted international efforts, the ozone layer is healing itself and is expected to recover by the middle of this century. The concerted efforts have contributed to the mitigation of climate change by averting the emission of more than 135 billion tonnes of carbon dioxide equivalent into the atmosphere by simply phasing out ozone-depleting substances. According to scientific information, reducing HFCs can avoid 0.5°C of global warming by the end of the century, while continuing to protect the ozone layer. The global citizens must turn ambition into action, and strengthen climate protection by the power in slowing the warming caused by hydro-fluoro-carbons (HFCs), the fastest growing of the greenhouse gases. A global problem requires a global solution. By reducing HFCs, humanity can avert up to two million cases of skin cancer every year and save many more people from the suffering caused by cataracts. He highlighted the message of the Secretary General of the UN, Mr Ban Ki-moon, who says that by using the Montreal Protocol regime to phase down HFCs, humans can complement other efforts to reduce carbon dioxide and other greenhouse gas emissions. On that Day, much has already been accomplished, and the global community commits to do more activities to protect the atmosphere. By working together, people can build a safer, healthier, more prosperous and resilient world for all people while protecting the planet, the only home for humans and other living beings. A pamphlet in Tamil was distributed to the children on the need to preserve the ozone layer. 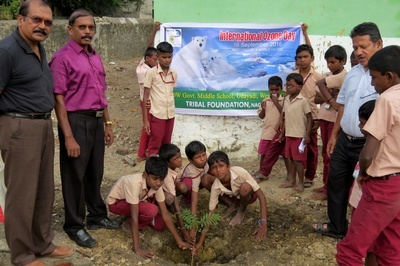 Students of the school planted trees in the campus.